Facebook represents an incomprehensibly vast collection of social interactions, but sometimes getting a sense of the collective pulse about topics — how people are responding to the legalization of gay marriage, or reactions to the latest presidential debate — doesn’t feel as straightforward as it should. In 2013, the social network giant launched Graph Search, a semantic tool aimed at making searches a bit better, but it wasn’t quite exhaustive — Graph Search didn’t search public posts that hadn’t been shared with you, for example. But now, Facebook’s rolling out an entirely reimagined search that’s based less around the people you know and more around what people are saying. On Thursday, Facebook announced that search queries will no longer be bound by your insular network — i.e., the people you know and the content that’s been shared with you. Instead, Facebook will index, in real time, the more than two trillion public posts and counting that span its massive network. The ambitious aim, product manager for Facebook’s search team Roussea Kazi said, is to transform Facebook search into a veritable parser of global conversation. “Because we’ve indexed the entire world’s conversations, we tell you things that are trending, things that are breaking, what’s happening right now” he told The Verge. The new search sifts through Facebook interactions as they unfold, taking a curatorial approach: search for a broad term such as “2016 election,” for example, and you’ll get a list of sources arranged essentially by which is the most authoritative. Posts by news organizations will more often than not float to the top, followed by friends, topical issues, and geographically proximate communities — you’re more likely to see posts from people you know and users in your country than strangers from across the pond. Search results are also personalized; the new Facebook search, like Google search, tailors results to your habits and interests. Unlike Google, though, Facebook does this with far greater precision, leveraging its veritable trove of data to inform the way its search function surfaces and organizes content. “We have to balance two things: how are the authors relevant to you and how is what they’re posting relevant to what you’re searching for,” vice president of Facebook search told The Verge. Every action you’ve taken on Facebook — every post you’ve liked, friend you’ve accepted (or rejected), and photo you’ve posted — will form the basis of the results. The new search is radically different from its previous incarnation. Graph Search relied essentially on a tagging system, prioritizing your social connections to help find specific categories of content such as photos of your friends, music your friends like, or restaurants nearby. Facebook’s new search, by contrast, is almost akin to Twitter’s recently introduced Moments feature. Boiled down, it’s an attempt to mold a firehose of social data into something cohesive, coherent and, all told, useful. The new Facebook search, however, has privacy implications that Twitter Moments doesn’t. Though Facebook is adamant that people who opt to keep their content private won’t appear in search results, it’s unclear just how many users know how to adjust, or are even aware of, the settings to do so. In 2012, Consumer Reports found that 13 million Facebook users in the US alone weren’t familiar with the social network’s privacy options. Facebook has improved the visibility of its privacy toggles since then, but the scary fact remains: regrettable comments made five years ago are now all the easier to find. But privacy, some may argue, may be an inevitable casualty of convenience. After all, Facebook’s only tapping into what many of its users want — according to the American Press Institute, 88 percent of millennials get news and information from Facebook and many (57 percent) check for updates more than once a day. Any tool to enable the surfacing of just the kind of topical posts they’re looking for makes sense, and that’s something Facebook’s retooled search absolutely accomplishes. 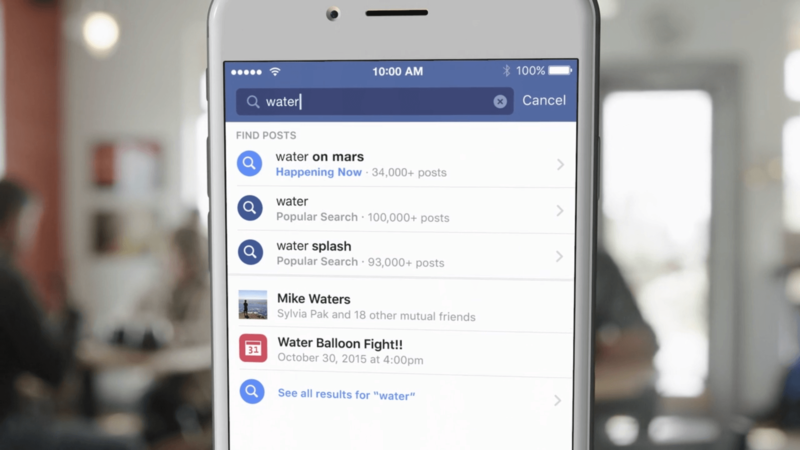 The new Facebook search is rolling out to users in English-speaking territories first. It’s launching on iOS, Android, and desktop over the next few days.